Cleaning in a simplest case is just removing bin and obj directories. MSBuild has RemoveDir task for this. NuGet packages must be always restored before building. Here is a good article about how restore NuGet packages on the right way. And here is the documentation form NuGet project about migrating MSBuild-Integrated solutions to use Automatic Package Restore. NuGet is a .NET program and is compatible with x86/x64 Linux system with Mono. Just download and save this file in /usr/bin folder and make it executable. To restore packages just run simple command in command line from solution folder. $ nuget.exe restore Installing 'MSBuildTasks 1.4.0.78'. Successfully installed 'MSBuildTasks 1.4.0.78'. Installing 'NUnit 2.6.3'. Successfully installed 'NUnit 2.6.3'. In MSbuild file this can be executed by Exec task. ToolPath attribute points to NUnit binary location. We can make this build target operating system independent by adding operating system condition and pointing target to the right path where NUnit is installed on different OSes. Note that NUnit version 3 the has only a binary named nuinit3-console.exe. To make MSBuild NUnit target work with NUnit v3 we need to copy nuinit3-console.exe to nuinit-console.exe. There is a special predefined console window on Windows “Developer Command Prompt for VS” with MSBuild in PATH. Все пакеты, перечисленные в packages.config, уже установлены. Note that on Windows MSBuild is not in PATH by default. Then to build application from command line a “Developer Command Prompt for VS” should be used. Project "d:\projects\C#\Mono\BuildingTesting\Build.proj" on node 1 (default targets). Done Building Project "d:\projects\C#\Mono\BuildingTesting\Build.proj" (default targets). Generally TeamCity can build both MSBuild and xbuild projects. There is a special build step runner called MSBuild for this purpose. But TeamCity version 8.1 (the last version at the time of writing this post is 8.1.5) does not (yet?) support xbuild Mono version 4.5. This issue is registered at TeamCity bug tracker: “Support Mono 4.5 profile“. 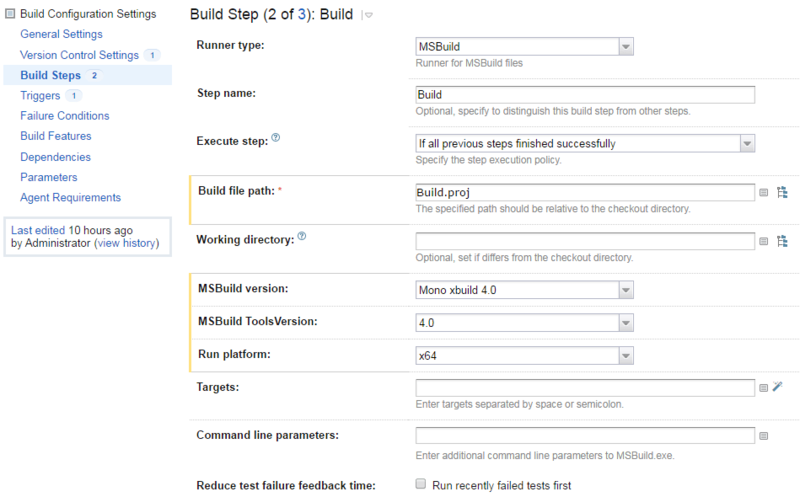 Thus we can not build Mono 4.5 application with this build step. We can not build Mono 4.0 application with it either because xbuild is not shipped with Mono 4.0 and TeamCity can not find xbuild. Thus I build Mono application using command line builder. xbuild must be in path in this case. 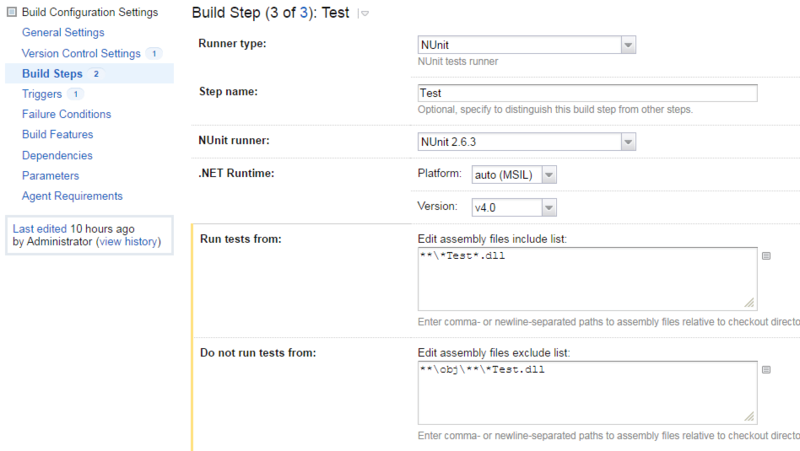 TeamCity has NUnit build step runner. Everything is quite straight forward here. Use template **\*Test*.dll to test all test dlls. And **\obj\**\*Test.dll to exclude all obj-test dlls. Could not load file or assembly 'CallQualityParser, Version=1.0.1.25142, Culture=neutral, PublicKeyToken=null' or one of its dependencies. An attempt was made to load a program with an incorrect format. this means that test assembles and executable modules are build with different platforms. Just control that Test project and other project in solution have same platform setup. It should be x86 or ‘Any CPU’ or whatever but it should be the same across test and other projects. Sample solution can be downloaded from here https://github.com/mchudinov/BuildingTesting. Solution is compatible with MonoDevelop version 5, Xamarin Studio version 5 and Visual Studio.